Mixing music is a good template for creating a music related presentation with a smooth flow of slides. Prezi has the vintage classic vinyl record with circular animation and Sound Mixer Console. 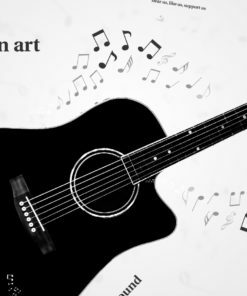 Black guitar on a 3D grey background. A good prezi for creating a music related presentation with a smooth flow of slides. Zoom in and add your content anywhere.